According to the OP, the rear pads off of a Solstice will work and the number I've been seeing for the pads are 1095's. If you're looking for stock pads check CED. I know he had a warehouse, well maybe a shelf full, of stock pads. They're not going to be shown on the website but send Tom an email. He'll get back to you in a flash. I actually got pads from Autozone. If you ordered the 525F.540 for your 08 SS/TC, yes they are the wrong pads. The 525's are for the SS/SC as previously mentioned. I asked Hawk to change their catalog and it took some teeth pulling to make them realize that the SS/TC's used a different pad, and one that is actually the same as the ones used on Solstice/Sky/ Saab 9-3, Volvo S40, and some of the Mazda3 cars. I ordered my 478F.605 via Tirerack by telling them I had a 2005 Mazda3 because they wouldn't use the correct data. I recommend adjusting the e-brake to prevent the rear pads from binding. I currently have the HB478F.605 HPS on the rear of my SS/TC. They produce far less dust than the stock pads, and the dust is a very light tan color when observed on the wheel. I've logged just about 1000 miles and the rotors are smooth to the touch. So the Hawk HPS part number listed by the op for the rear is wrong? It says "Hawk HPS rear - HB525F.540" you say "HB478F.605 HPS Performance Street", so did I order the wrong pads? Thanks for the update, changed the post to reflect - these part numbers were taken from HPS before they changed them. Not to burst your bubble but I've been working on cars for over 8 years so I know what I'm doing. I saw both numbers in person and unless they were boxed wrong, the 1033's looked nothing like whats on my car. Please update me when you find out. If the 1033's are wrong let me know the right part. For now Im removing that from the list just in case. Send a private message to IsItFast? Find More Posts by IsItFast? Thanks for updating the list. Maven was the first to figure out the right part # last December. I talked to Wellman/Hawk and asked them to change their catalog to show the correct pads for the 08-09 SS/TC. Whatever part # you find on their catalog should be the correct part. 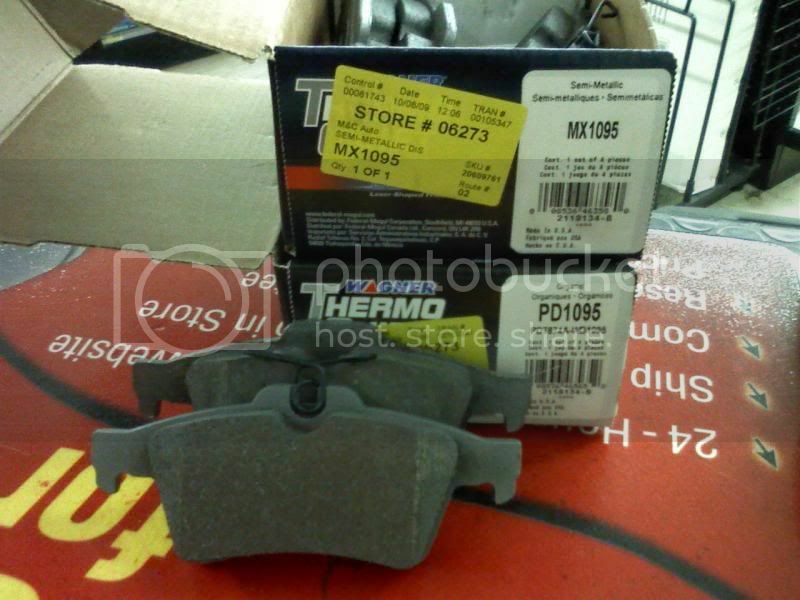 I don't know of many good OTC brake pads at AutoZone or Advance Auto. The pads I used for the rear were 1095's. Yeah, the 1033's are wrong. You need 1095's. Here ya go. This is a picture of Semi-Metallic and Organic pads...Wagner, Advance's premium line. so uhhh how much are the rear slotted r1 rotors with hawk hps pads? i dont know if anyone is reading this post anymore but the HPS pads are great only draw back is that even with a disc brake quiet on it the will squeeeeaaaak but they do stop good. Did you bed them properly? I am still using the stock Brembo pads in the front, but with HPS in the rear. The first thing I did was bed the brakes in an empty parking lot. Just so you know. Im reading this thread. just got a new cobalt SS. Thank you everyone for all the info. Napa now carries rotors for the rear of the Cobalt SS. part number 48880706. Any EBC Brakes pads/rotors for our cars? Yes no maybe so on EBC pads/rotors? Ok . so I'm on tirerack and make a search for a 2009 SS sedan .. and no brakes come out .. I then made the search for a 2008 SS Coupe .. and there ya go .. are the brakes different? .. I don't think so .. I have the first set of EBC pads on the front of my '08. I got them for free for test fitting them. I also got a set of Solstice rear pads to test fit on the rear for free. Both sets fit great. I am using the red stuff pads. I would contact EBC, I'm pretty sure they can hook you up. Thank you for all the information. It came in very helpful when I just had to replace my rear brakes. what front pads do you guys recomend? i got the Wagner rear pads with some rotots off tire rack. i got front rotors fromt tire rack tring to not spend alot but no one not even the dealer can find the right front pads. Just purchased a set of the EBC Red Stuff pads from Place For Brakes for my 08 SS, these are the Ceramic pads that are a street pad with less dust.. The ebc part number that was sent was DP31539C.. Will have them put on here by the end if the week..
R1Concepts also offers the front rotors in whatever flavor you want (plain/slotted/drilled/slotted+drilled). So... i'm looking for rotors and pads for the rear of my 09 ss sedan... i cant find ANY... i havent been looking super hard yet, only for about 15 minutes... but i can find them for the 08 coupe.. are those the same? What about the other years.. do any of those fit the rear of the 09? You can get them at the dealer, R1Concepts, etc. I've got R1 rears currently, with Hawk HPS pads. Can anyone here direct me to a known working caliper piston tool for the SS/TCs (mine's an 08)? I spent a good bit of money for a "good" universal kit one only to find out it had just about everyone's key except one that will fit the Cobalt. The tool I have (Neiko 11 pc kit), when used like a C-clamp (i.e. no key in use) seems to have pushed the piston back some, but not enough to fit the Hawk HPS pads (HB478F.605) and a new set of the NAPA vented rotors. Almost wondering if the two are too thick for the piston or if its just not pushed back far enough.